Here you can help guide your child in planning for the future. Explore together the many tools and activities designed to prepare students for college and career success. 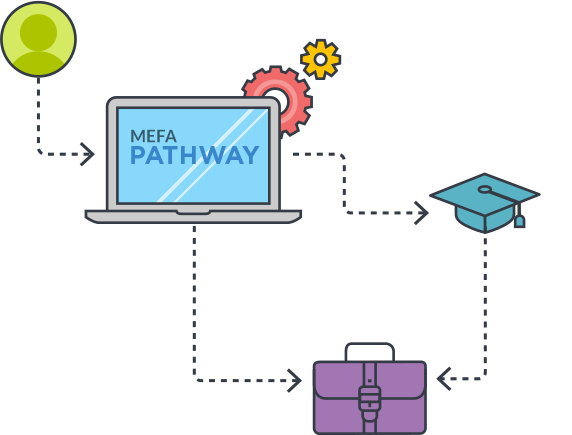 MEFA Pathway is the interactive destination for students plotting their educational and career plans — and parents helping them on their way! By engaging students in grades 6-12 — through the use of dynamic, fun, and enlightening tools and features — MEFA Pathway acts as a repository of student activity and helps reveal interests, skills, and opportunities. As students interact with MEFA Pathway, parents can participate along with them as strengths are discovered and ambitions are set in motion. 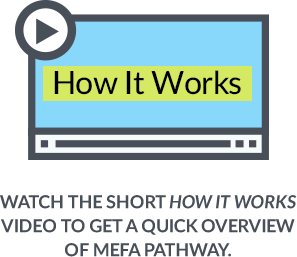 MEFA Pathway features tools, quizzes, and activities designed to help students research and chart a highly personalized plan for the future. For parents, MEFA Pathway offers an insightful window into a student’s progress, plans, and priorities. Additionally, parents can turn to MEFA Pathway as a resource for learning how they can remain engaged in, and prepared for, their child’s post-high school life. We encourage you to log on regularly, with your child, to engage together with the many facets of the tool and for helpful reminders about important dates, events, and announcements.